In Katherine Dunn’s 1989 novel, Geek Love, two freak show performers debate the merits of reading horror stories. “Don’t you get scared reading those at night?,” the sister asks her older brother, Arty. Arty, who makes his living by showcasing his limbless body, reads the horror novel as an instruction manual for any person with disabilities who wants to get ahead in the world. Instead of lamenting the fearful stories his body conjures, Arty delights in the power their reactions can give him. As he sees it, those who fear him—the “norms” who see his body as an emblem of weakness, decay, or monstrosity—are trapped in their own stories. The person inhabiting the “monster’s” body, on the other hand, has the advantage of knowing the truth is far more complicated. Nick Santonastasso, a twenty-first century teenager, has created considerable buzz by wholeheartedly inhabiting the monster that his body evokes. An avid fan of the Walking Dead television series, Nick sets up pranks that transport the relentless, decaying zombies off of the television screen and into the spaces of everyday suburban life. 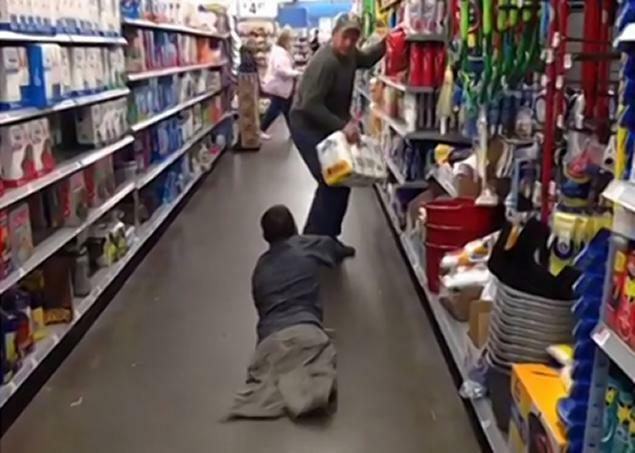 He stages zombie attacks at boring, everyday locales like supermarkets, all the while filming his victims’ frightened reactions at the horror crawling towards them. 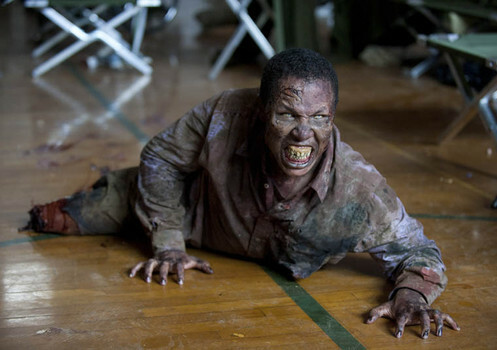 Nick is able to evoke the zombie’s onslaught so effectively because his body fits the profile of the many of the monsters who appear on The Walking Dead. To be specific, Nick has one limb instead of the typical four. Since the recent zombie craze began, fans and critics have had a field day determining what zombies are really symbolizing. There’s an argument to be made that zombies reflect the anxieties of whites fearful of a race war. Others have seen the shuffling hordes of the undead as metaphors for our mindless, voracious consumerism, or even the relentless onslaught of Internet trolls. That’s the thing about monsters: they provide a canvas, and you’ll see what you want to see. Or, I should say, you’ll see what you’re afraid to see. But there is one zombie attribute that requires no metaphorical reading. Their bodies are, quite literally, falling part. Zombies are the product of illness and disability, and reflect the terrifying lack of control that these conditions allegedly bring. Now, it wouldn’t be fair to say that Americans see the story of disability solely as a horror story. 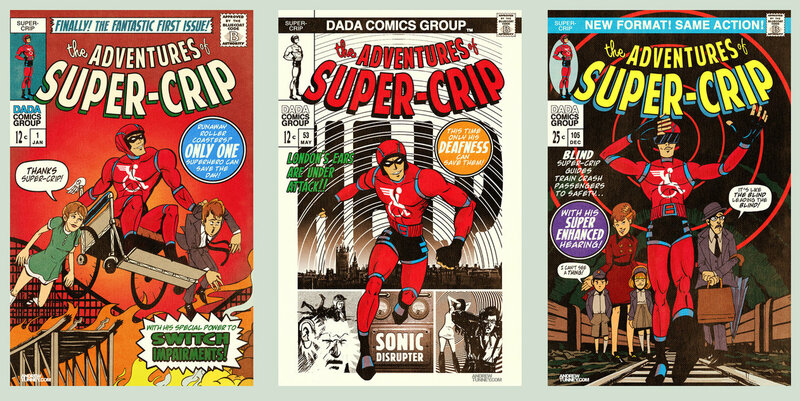 Our very favorite narrative about disability is an inspiring one: we are always ready to applaud the story disability activists have called the tale of the supercrip. The supercrip is a person with disabilities who cheerfully, bravely, resolutely overcomes the obstacles posed by his or her body. We thrill to tales of people with disabilities running marathons, climbing mountains, and breaking records. We love these stories because they reassure us that no matter what physical difficulties might arise, we can still bend the body to our will. We—our minds, our desires—are still in charge. The zombies of the The Walking Dead are about as far as one get from the supercrip and the triumph of mind over matter they represent. The show is populated by unwieldy, voracious bodies that refuse to be controlled by brains (well, they are controlled by the desire to eat brains, but that’s not the same thing). The very first episode depicts a weak, disoriented protagonist who wakes up in a hospital gown to find a world destroyed by an infection that defied all human ingenuity. 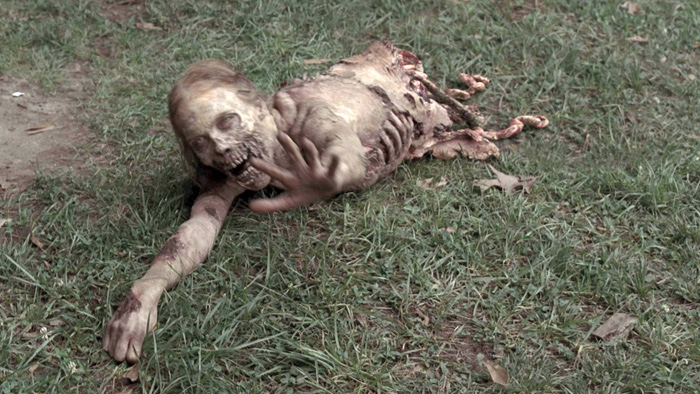 In the bleak world of world of The Walking Dead, physical weakness is an ever-present threat. Pregnancy, old age, infancy, or just a bad case of the flu are all it takes to cross into the terrible realm of the zombies. 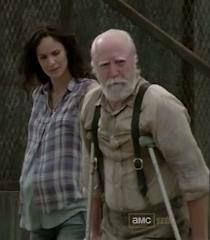 Lori and Hershel from The Walking Dead, neither of whom could walk very fast. The zombies are themselves rife with sickness and accompanying disability. It’s striking how often the “Walkers” are incapable of walking at all. One of the first zombies Rick kills is missing her legs. 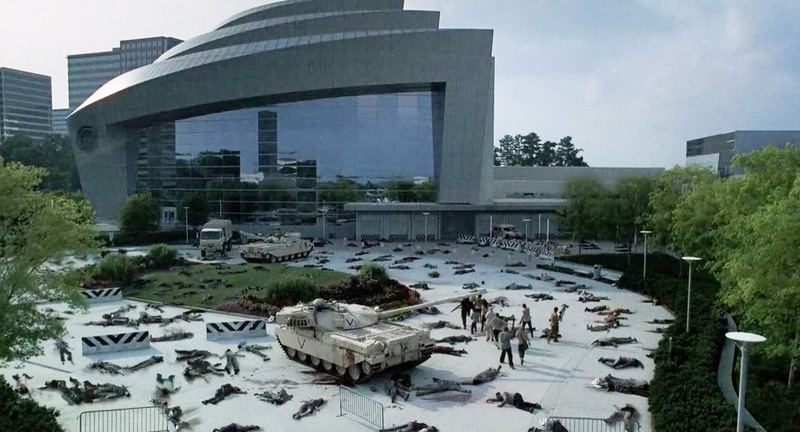 More recently,the villainous Governor narrowly escapes a building filled with zombified nursing home patients, whose disabilities prevent them from being effective predators. It’s in this world that Nick Santonastasso has placed himself, as he gleefully depicts the mindless bodies our culture so loves to fear. In short, he’s made a name for himself by embodying the most monstrous version of disability haunting our national psyche. It is a bit of a gamble. 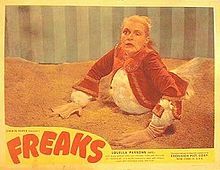 Nick willingly plays into the shock that comes from the similarities between his supermarket antics and iconic horror-show images of disabled bodies.The scariest scene in the Tod Browning’s cult classic film Freaks features disabled freak show performers crawling through the mud to attack able-bodied characters. By rendering his extraordinary body a monstrous one, Nick evokes, for at least some viewers, the painful memories of the freak show. The reality of the American freak show doesn’t do much to support the idea–shared by the fictional Arty and the real-life Nick–that people with disabilities can play the monster while escaping the monster’s fate. Throughout the late nineteenth and early twentieth-centuries, freak show managers and audiences exploited people like Julia Pastrana, a hirsute woman whose husband/manager charged onlookers to watch her give birth. Even after death, her body was a valuable commodity to her husband, who had her body—and that of her dead newborn—embalmed and put on display for the entertainment of onlookers. The fate of Pastrana, Sara Baartman and others reveal how difficult it is to avoid being consumed by the stares of an audience that sees your body as a validation of their own disabling stories. But I think it’s precisely this tension between “good” and “bad” stories about disability that makes Nick Santonastasso’s pranks so smart, and so powerful. Santonastasso’s initiative and skill evokes the admiration normally reserved for the supercrip, even as he plays a role that exploits our fear of the bodily havoc associated with illness and disability. In so doing, he demonstrates that the angelic and demonic portrayals of disability—the hero that rules the body and the monster who destroys it—are two sides of the same coin. In a culture that so often looks to the bodies of disabled people to reaffirm our need to feel in control of uncontrollable forces, Nick makes the “norms” watch themselves. The freak show often portrayed people with disabilities who were exploited by the fearful, fascinated stares of others. Nick, with the aid of a camera and the internet, has turned the gaze back on the audience—on the “norm” who reveals his/her fear, and can do little but grin sheepishly at how silly it is to be afraid of monsters.